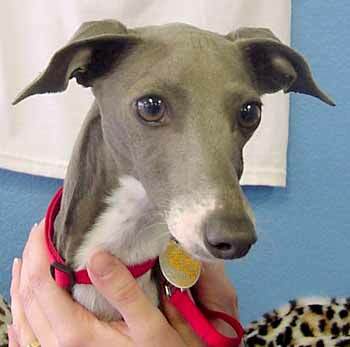 Blue is a 13-month-old blue and white Italian Greyhound, born January 28, 2002, weighing 10.5 pounds. Blue has been in a home since he was a puppy but was given up because the family did not take the time to prepare for the special needs of this specific breed. He is a sweet and loving little guy, and will thrive with the right family. 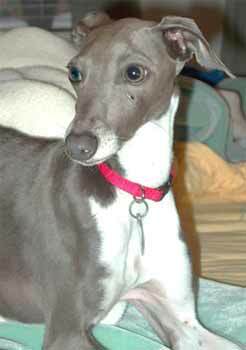 Blues foster family consists of a greyhound, 4 Italian greyhounds and a Maltese. His foster mom knows this breed very well. Blue is very sweet and loves to cuddle! He loves to be kissed and gives lots of kisses himself. He is active and needs lots of attention. He is a true lap dog. 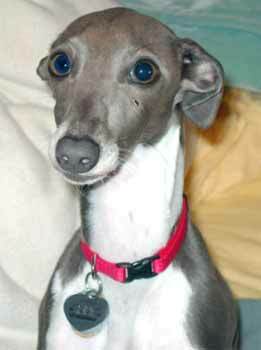 These are all very typical of an Italian Greyhound. He does well with other dogs, large and small. IG's shed very little and are basically odorless. We are working on his housebreaking, and he is now wearing a 'belly band' that aids in these issues. Crate training is recommended while in housetraining mode. Blue is also working on his manners when it comes to 'people food' but is doing much better with this as time passes. Blue will make a wonderful addition to the right family.